On the heels of my last post about photography, I've thought a bit about modeling the relationship between photographer, camera, and subject, and I took a shot at plotting it in classic two-dimensional space. I wish I could make some exciting claim... like, this is the decisive way to model the photographer's art, and all other theories can be reduced to this structure... but obviously none of those things are true. This is just one theoretical shot in the dark, the type of thing that Marshall McLuhan might have called a probe... which is the most creative and least rigorous way of doing theory and analysis. 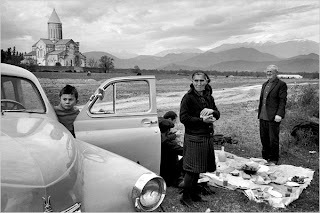 I've perused some of the key literature on photography, like Flusser's Towards a Philosophy of Photography and Susan Sontag's On Photography. I know that the former theorist really emphasized the black-box nature of the camera itself, claiming that the essence of photography was to be found in the photographer's relative ignorance of the physics and optics that actually capture his image. Sontag seems to take the idea of "capturing" the subject more literally, claiming that photographs possess an inherent aggression, and that photographing a subject is appropriating it, certifying it, collecting it, and at the same time protecting the photographer from its full psychological force. My own ideas are a riff on my last post, that in photography, the key issues are 1) choosing our subjects, and 2) determining our final products, whether by composing the images or by carefully curating them. These are the two axes of the conceptual space. The vertical axis is the choice of subjects: we either find subjects by discovering them out in the world, or we create subjects on our own terms, employing craft and artifice within a controlled space. The second axis, the determination of the image, is centered around the idea of CAPTURING, and it's split between composing images before the shot, or curating them after the shot. 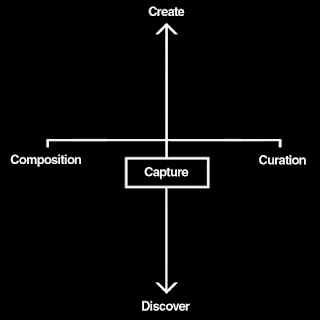 Interesting to note: the spectrum that goes from "curate" to "compose" correlates to the shift from film photography to digital photography. When you only had 36 shots in a roll of film, it was extremely important to frame your composition carefully, and manage your exposure with precision, so you didn't waste a shot. Those were the days of Ansel Adams, zones, and the rule of thirds. Most of the image-determination took place before you clicked the shutter button. The inverse of that is the curation model that's come to prominence in the era of infinite storage, crowd-sourced galleries, and snapshot Polaroid kitsch. These days, you shoot as many photos as you can, using a few loose rules of composition... know your aperture and shutter speed, experiment with exposure, and try to isolate and differentiate your subject. Once you take hundreds of exposures, you've got a new job: go back with a severe critical eye and figure out which ones are actually worth further attention. Intensive curation (and post-processing) has taken the place of obsessive composition, rendering the latter an anachronistic fetish. 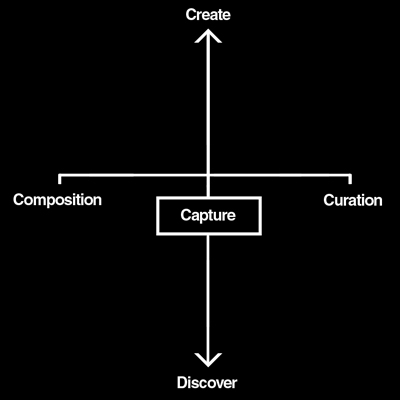 There are some exemplary types, mapping to each of the four quadrants. Landscapes are the ideal case for the traditional craft of film photography: you, the photographer/explorer, go out into nature to discover a stunning vista or a sublime subset, and then you put all your technical skills and craftsmanship into composing a single perfect photo, captured in your 35mm frame. Fashion portraits are essentially the opposite: instead of discovering the landscape in its natural state, you create a scene and sculpt your models, and you direct them in their gestures and positions. Then, like a vigilant moon, you orbit around them, trying to capture a natural moment or a sharp glance, taking as many shots as you possibly can (as a fashion photographer, you should always max out your camera's capacity). You'll depend on your curatorial skills to select the best exposure after the session is over. The most artificial type of photography is the food photograph, in which the photographer creates a perfect sculpture of the food (often inedible) and then painstakingly composes the shot to bring out the shapes and textures, with grave attention to depth of field and isolation of the subject. 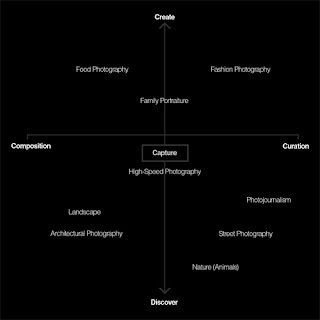 In the opposite quadrant -- discover and curate -- is the street photographer and photojournalist, the visual scavenger who scrounges for the perfect, fleeting moment, and then pursues it like a hunter, hoping beyond hope to catch it and harvest a perfect exposure in the heat of the moment. "Street photography has a sort of visceral thrill, and a sense of purity, the very honest and unadorned ethos of aestheticizing the gestures and postures and details of everyday life. At times, it feels like this is what other types of photography (especially Fashion Photography, the most glamorous of the photographic disciplines) aspires to." This was an honest sentiment, but it was also the result of my recent interest in street photography, so it's a bit self-validating. It completely short-sells the creative and compositional aspects of photography... the act of arranging a scene to be shot, and the act of composing the actual picture within the frame, both of which were part of photography long before ye olde point-and-snap. 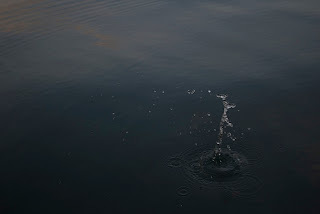 Oddly, looking back at my quadrant, I've decided that there is a different type of photography that really exemplifies the spirit of the medium, and it's not one that I expected. It's actually the high-speed photograph, like those amazing shots of bullets going through light bulbs! Imagine that! After all, it's both an exercise in perfect composition (choose the right light, arrange the elements, organize the frame) and an exercise in perfect timing, which can only be achieved by sifting through thousands of imperfect exposures produced by the experiment. It's also a triumph of both discovery and creativity: the photographer creates a perfect scene, but then has to discover an elusive fraction of a millisecond within the physical unfolding of the action. Also, it's aggressive, per Sontag: the photographer is forcibly extracting a cross-section from the middle of a lightning-fast burst of movement. And it's highly mechanized, as per Flusser: it's so precise, it can rarely be managed manually by the photographer, and usually requires an extended mechanical apparatus to initiate the action and release the shutter. This is the essence of photography. Who knew? Or maybe this is a great example of how rational over-analysis can lead an intellectual douchebag into a totally misguided conclusion. Contrary to the evidence, I still take all my claims with a grain of salt. In conclusion, I leave you with two of the only high-speed captures I've ever personally attempted, which I think resulted in some of my better photographs. Thank you for reading this rumination on photography. Jesse out. EDIT: Paragraph 3: That is obviously not the horizontal axis, it is the vertical axis. 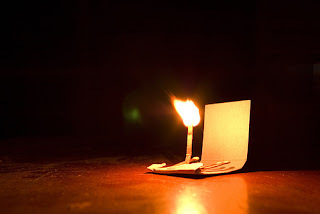 I've rediscovered photography recently, and it's got me thinking again: how do I relate to this mode of production? What are my strengths, if indeed I have any? What have the masters and the rising talents discovered about this craft that's still obscure to me? Is there some necessary pivot point, beyond the useful-but-extremely-general 10,000-hour rule? Some solution to the rubik's cube of photography itself, both within the genealogy of artistic practice and in its essential difference from all other art forms? As I was, as I called it, "rediscovering" photography, I went first back to Flickr, the old bastion for my curation and display of my photographs. Flickr still has some great features: a metric ton of groups that can provide some extra visibility; a very large community that all your friends are probably already a part of. Unfortunately, it's succumbed to some issues that tend to affect these kinds of specialized communities. For instance, it's got so many people on it now that it's inconvenient... nigh impossible... to filter out the noise, so there's no thrill of exploration and discovery. This is a crippling blow, because curation is a big part of this art form, and community and networking were HUGE parts of Flickr's appeal. Enter: a new site, called 500px, which does a beautiful job of recapturing the freshness that Flickr once had. Its layouts are cleaner, and its population of artists is more streamlined and engaged. The "Fresh" photo page (containing an unfiltered stream of the most recent uploads) tends to have at least a few great photographs on it, waiting to be selected and appreciated by the growing audience of enthusiasts, among whom I count myself. Maybe 500px is just the beneficiary of a smart release and a rush of proficient early-adopters, and the glow will fade as more people discover it. Ideally, it never takes on the broad, middlebrow mass appeal of Flickr, and becomes something in relation to Flickr as Vimeo is in relation to YouTube. We can always hope, right? At any rate, thinking thus about photography has turned up some new artistic concerns. There are two in particular I've been finding increasingly relevant, and they're not the standard technical considerations of composition, light, color, timing, or framing. 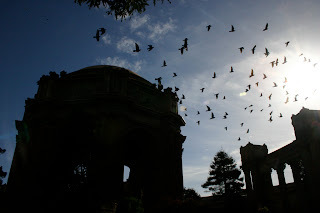 They're more embedded in the process, and I'm trying to locate their unique position in the art form of photography. Maybe the best place to do that is in the realm of application and practice, but there's at least a part of this examination that can take place here, in words, on the digital page. The first of these is curation, which I've already mentioned a few times in this mini-essay. It's the digital age that's forced us to think increasingly in terms of curation, because the steps between shutter-button and final product are so much more compressed in the point-and-click digital age. In many areas (coughTWITTERcough), self-editing seems to be an art in rapid decline. In photography, if you're to be taken seriously, even merely as an Internet personality, it's becoming more and more important, as your work is in danger of getting lost in the sea of Instagram snap-shots and photo-dumps. And if too few people seem willing to edit, temper, and critique their own output, it's because peoples' consumption habits are being blunted, along with their production habits. In curation, the two are merged. You can see this in evidence, by looking at some of the most prominent photographers on Flickr. One of my favorites, Alex Stoddard, only posts a few photos each month. This could be partly due to the time he takes in production and post-production, but as far as my own experience, each session with the camera could produce five or six easily-postable shots, if you're not severe enough with your own work. The other thing I've been thinking about isn't something that's specific to photography in any way. In fact, it's a key component in every mimetic art form, and arguably, in all creative production whatsoever. Nonetheless, it seems to be something that the well-regarded photographers have figured out, and (also arguably), it's the key threshold between being an amateur and a virtuoso. This is Choice of Subject. There are whole artistic movements that seem intent on distracting artists from this very question. Classicism and modernism are both hung up on form, for instance... and in many arts, there's a preoccupation (or at least a transitional obsession) with technique, precision, craftsmanship, and operation of the apparatus. But with every art form, and with photography in particular, the choice of a subject is a critical threshold without much breathing room on the near side. The art form is fairly lenient in giving you the choice of a subject -- pretty much anything that can be captured with the eyes in three dimensions can be flattened onto a photographic print -- but this choice of a subject will feed back profoundly, influencing every aspect of your practice: your technique, your equipment, your audience, and your place in the community. In my own research and practice, I've become particularly attached to something called "Street Photography"... or as I might prefer to call it, "clandestine portraiture." I don't think this actually needs to happen on the street, but photography taken on the street is what most people picture when they think of this type of lifestyle photojournalism. It's the photography of people, heedless of the camera, behaving and interacting in their natural environment. This is often (usually?) as simple as standing around smoking a cigarette, or drinking coffee. At times, it's a shot of somebody walking purposefully to their office, or a shot of two people talking heatedly about something obscure. It's the attempt by certain photographers to capture the living essence of life in some chosen environment. The first time you do it, you'll probably struggle with the idea that you're invading the privacy of your subjects, and it's certainly a valid ethical question... to continue with this particular type of photography, you've just gotta find a way to convince yourself that it's okay (for instance, that your good intentions excuse your methods and your subjects' lack of explicit consent). Street photography has a sort of visceral thrill, and a sense of purity, the very honest and unadorned ethos of aestheticizing the gestures and postures and details of everyday life. At times, it feels like this is what other types of photography (especially Fashion Photography, the most glamorous of the photographic disciplines) aspires to. Where fashion photographers try to create an illusion of a highly stylized reality, the street photographer is attempting to allow the beauty, the style, the honesty of unconscious human agency speak for itself. Of course, this carries with it some constraints: it's hard to frame a good shot, so the calculated composition of some types of photography (landscape, architectural) is out the window. To compensate, the street photographer is advised to get a LOT of exposures, and curate them aggressively. A high degree of external awareness is also important, because the photographer doesn't have time to sculpt and control the light, nor to attempt multiple exposures of the same shot. Timing is paramount, and the result is a "capture," rather than a "composition." Ultimately, the "composition" is largely the work of chaos and chance, and the photographer is merely a gentle guide, rather than an authoritarian hand. There will be a lot of bad shots, and the photographer won't feel much of a direct causal responsibility for the good ones. All these terms -- capture, composition, curation, shutter speed, control, and chaos -- can be considered as part of the broader theoretical vocabulary of photography. I think I'll elaborate on this in a near-future post. For now, though, I'm going to try to keep shooting, and (along the way) discovering new photographers who can help me look on the world with fresh eyes. I have a long way to go to get to 10,000 hours, so I have to hope that part-way there is good enough for now. And maybe for always. New Years Eve 2012 brought some fun and unexpected things, like Linguini in Sea Urchin Sauce, and some tragically predictable things, like three different pedestrians throwing up on the subway ride home. New Years Day 2013 -- that brought something else, sometimes amusing, sometimes unexpected, and sometimes inane: a kaidan samurai movie from 2005 called Ashurajō no Hitomi (or by its American title, Ashura). It's been two days since I saw Ashura, and I'm in danger of suddenly and sadly forgetting the entire film. It wasn't the type that lingers in your consciousness for days, eating away at you with its moral ambiguities. The plot is adapted from a 1987 play, and it runs through the standard litany of romantic, kung-fu, and fantasy tropes. The world harbors a secret population of demons, and their requisite containment force, a militant cult called Demon Wardens. During one of their standard purges, one of the Wardens accidentally kills an innocent child, and he decides to retire from the monster killing game. He is only thrust back into it when he encounters a young woman with amnesia, and takes a mysterious personal interest in her. She rapidly complicates his life, and leads him into an entanglement in a long-simmering plot to bring Ashura, the demon queen, back from the dead, according to prophecy. The film does not look expensive, nor created with any subtlety of craft. Indeed, the cover on the film's Netflix page looks a lot cleaner and more beautiful than any frame within the actual running time. You know the demons because they flash distorted toothy smiles and green eyes, and they splash green blood when they're killed. There are copious badly-rendered backgrounds and strange computer-generated landscapes. 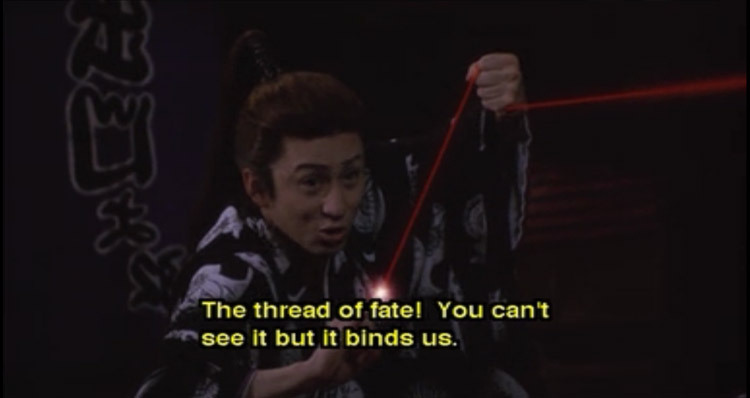 Most of the mysterious magic power that manifests is silly CGI fireballs and glowing laser "threads of fate." It's bad cinema in the best tradition, melodramatic and desperate to be impressive in whatever way it can. Of course, being the forgiving type, I noted all the things I appreciated about it. One of the stock main characters becomes a pretty compelling villain, and the love story that's central to the plot is handled with the kind of soaring drama that's uniquely allotted to unselfconscious trash-cinema stylists. The film's ambitions are kind of endearing. It's also notable in that the true villains of the story are not puppets who embody pure evil, like Bizan... they are all characters who start out as heroes, and whose motivations are twisted by ambition and resentment. Also, "My Funny Valentine" is a pretty awesome closing credits song, totally unexpected and eccentric at the end of a movie like this. But most interesting to me, above all, was the storyteller's subtext. After he leaves the Demon Warden profession, Izumo, the main character, becomes an actor in a kabuki theater, under direction of a doddering playwright who's forever trying to sacrifice his own employees to demons in order to create drama for his productions. Of course, he ends up writing down the deeds that make up the film. This whole parallel plotline deserves at least a little exploration, before I rate the film on Netflix and stop thinking about it. 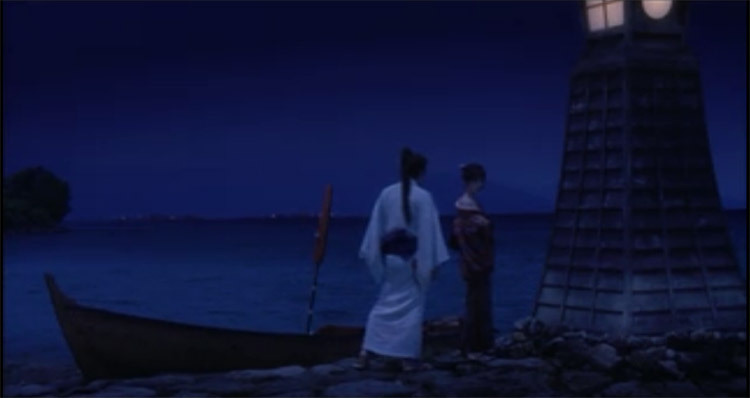 The film actively emphasizes the Kabuki element. Izumo is depicted on the banners outside the kabuki theater, and he repeatedly makes the cross-eyed kabuki face... first as an actor in his plays, and later during his confrontations with Bizan, the demon mistress. This may just be meaningless comic detailing, an attempt to add a little spice to a generally boring main character. To me, though, it actually suggests something about the level of self-awareness that went into the crafting of Ashura (either the film or the play, depending on their differences). Kabuki theater is infamous for its exaggeration and stylization, and at least in Ashura, it's also noted for its high melodrama and tragic conclusions. This is part of what characterizes this very movie... a capricious use of cheap effects, an uninhibited rendering of a desperate, flawed romance, and an intensely stylized, heightened depiction of life in medieval Japan. The film and its director are saying, "We can't create a conventional masterpiece, with the control over tone and setting and style that a larger budget and longer timeline would allow, so we are going to let loose and go all out with those things that we CAN control: the glow effects, the background compositing, and the sentimentality of the performances. We have no reason not to make this as epic as we can, within those parameters." And when you feel this enthusiasm, this kabuki-inflected confidence and self-regard, you may discover a deeper level to this film's charm. You may allow hold your laughter for a second, and in receiving it as the vast and soaring myth that it wants to be, you may discover a really elemental, beautiful movie, doing its best to escape a second-rate Kabuki fever dream.